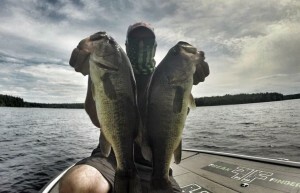 A bass fishing media project for the serious weekend angler. July 29, 2017 Marc S.
Try these simple techniques for taking bass on a dropshot rig all season long. Similar to the Celtics legend, the dropshot rig is a tried-and-true player that typically comes off the bench during the summer months, when smallmouth and largemouth bass move to deeper haunts. However, some simple refinements can allow the rig to become an effective part of your starting lineup all season, from ice-out to ice-in. Our go-to bait at Freak Finder Fishing is the Beast Coast Fishing 3.5” Magic Flick. We rig this bait with either an Owner 1/0 Drop Shot hook or a VMC Spinshot 1/0 Dropshot hook. The VMC model has a swivel on the hook eye that helps decrease line twist, a common issue when with the dropshot presentation. The bait is nose-hooked, which allows it to sit horizontally above the weight and appear very lifelike. As for the weight, we use Beast Coast Fishing Transmit-R dropshot sinkers. Always use the lightest sinker you can get away with yet still maintain contact with the bottom. On windy days, you may have to use a heavier weight. Always start light and go up … but only if you have to. This is a technique that involves a small hook and light line, so you have to be careful not to overpower the fish on the hook-set or when fighting a fish to the boat. A light-action rod and a smooth drag system are essential. The Denali AttaX 7’ medium moderate spinning model is our go-to rod for dropshotting. We pair it with a Team Lew’s Pro Speed Spin 2000 Series reel. When setting the hook, simply lift the rod to apply gentle pressure, and reel quickly to catch up to the fish. This is where the 6.2:1 gear ratio on the Lew’s Pro Speed Spin comes in handy. To help with hook-setting, braided line is the ticket. We like 10-pound-test P-Line TCBX-8 braid with a 6-pound-test P-Line Tactical Fluorocarbon leader. The braid gives you feel and power while the fluorocarbon makes the leader less visible. It’s the best of both worlds. The trick to making your dropshot rig more versatile is to focus on the length of the leader to the weight. In early spring and late fall/early winter, smallmouth and largemouth bass are largely inactive given the cold water (40 to 45 degrees), but a dropshot rig with a very short leader (1” to 2”) will still catch them. Many refer to this technique as a “zero shot.” Later, during the spawn period, dropshotting can be a great way to catch bedding fish, as well as fish cruising the shallows. For these applications, the leader should be extended to about 4” to 6”. The period when the fish move out to offshore humps, rock piles, outside grass lines, and other summertime structure is when the dropshot found its initial popularity. At this time of year, a leader of 12” to 18” is the way to go. Baitfish will suspend on deep structure at this time of year, so getting your bait off the bottom is key. In the fall, when the bite is feast or famine, a dropshot is a great addition to your arsenal because it can be fished from shallow shoals out to deep-water wintering holes and everywhere in between. At this time, use an 8” to 12” leader length, depending on water depth. The fall is all about finding the forage, and when that forage is perch, alewives, sunfish or shiners, it’s hard to beat a dropshot setup. With all that bait around, the fish can be selective, so a natural presentation is a must. To simplify the strategy, keep this rule in mind: The warmer the water, the longer you should make your leader, and vice versa. Apply these thoughts and techniques as you search for largemouth and smallmouth bass throughout the season, and you will find yourself starting the dropshot on game day.